Guys. Real talk. How are you feeling about 2017? I’ll be honest, I’m discouraged. I’m looking for the light, and looking for it, and squinting my eyes really tiny up at the sky searching for it, and getting out my binoculars, and my magnifying glass, and welp. I’m having a hard time finding it just now. But the good news is this: I’m pretty sure it all works out in the end. In fact, I feel that to be true deep in my bones, even if I’m having a hard time believing myself right now. In the meantime, I’m borrowing hope wherever I can get it. I think it would be fun to start a weekly column here on Petit Elefant where I share all the fun, happy, uplifting things I find on the internet, just to keep things interesting and cheerful. In fact, that’s one of my blog goals this year. 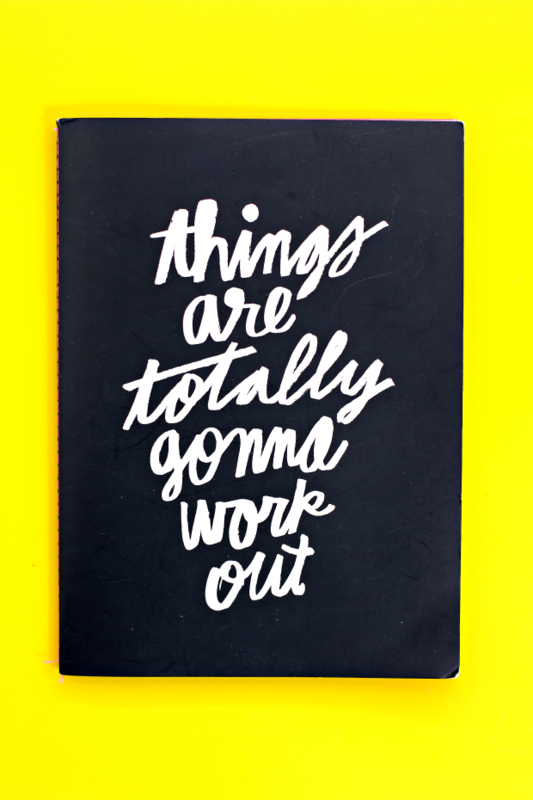 I even wrote it down in my new ‘things are totally gonna work out’ journal*. Which brings me to my next point. Do you have any New Year’s resolutions? I’m definitely a New Year’s resolutions kind of girl. I really like notebooks and goal setting and thinking about new things to accomplish. But I have to be careful with myself because I’m very ‘Type A’: overzealous and ambitious in all things. If I don’t reign myself in a little I can get carried away and fill entire notebooks full of things I need to change about myself, diet ideas and exercise plans, lists of senators and congresspeople to call every day, and 10-step editorial plans to revamp Petit Elefant. My goals are pretty simple, by design. I don’t know if this is true for you as well, but if I over-complicate things, I know I won’t get anything done. This is pretty important in goal setting: be realistic about yourself and what will work in your life. If you want to work on getting healthy, maybe it isn’t possible to start working out 4 and 5 days a week in the beginning, but maybe you can go for a walk for 20 minutes during your lunch hour every day. Baby steps to success guys, it’s real. The other important thing about new goals is this: as you move along in your goals throughout the year, if something isn’t working, let it go. If something is really important to you, move stuff around a little. Maybe on top of getting healthy you want to spend more time with friends, and the lunchtime walk isn’t working out so well. But the gym near your house has an evening yoga class you can go to with a friend. Two new goals, check-mark, boom, you win at life. What are you working on right now? How are you feeling about things? I’m an eternal optimist, and I love turning over a new page on the calendar every year, but my goodness this year has been tricky. I’d love to hear how you manage new goals, and you guys, things are TOTALLY gonna work out. << Hello 2017 + Welcome Back Friends!